Alliance Française de Bombay, Avid Learning and Royal Opera House, Mumbai present Kathakali-King Lear directed by Annette Leday and David McRuvie, an intercultural performance which brings together the four century old Kathakali Dance Form with the Shakespearean Tragedy King Lear. Originally premiered in 1989, it has since been performed in prestigious venues around the world for over a decade. The last series of performances took place at the Globe Theatre in London from 6 to 17 July 1999. Since its creation, it has become a reference in the field of intercultural performance and has been the object of enthusiasm and passionate polemics, as well as of numerous academic studies. Since 1989, the company has created many other choreographies of contemporary design which have always featured Indian performers who participated in the Kathakali-King Lear. This performance is a revival of the Kathakali-King Lear production and will feature the generation of artists who originally participated in this piece in their youth and who have now reached the full maturity of their art, in the main roles of the play. All the written documents and videos produced during the creation in 1989 have been carefully preserved, which will allow a rapid and faithful reconstruction of the staging and the choreography. After touring in India this year, it will be performed at the Théâtre de la Ville in Paris in April 2019, marking the 30th anniversary of its creation. In Kathakali the emphasis is on the dramatic elaboration of relatively simple intrigues. Unlike any other Shakespearean tragedy, King Lear is made up of two parallel intrigues, that of Lear and his three daughters and that of Gloucester and his two sons. By suppressing the Gloucester material, the Lear story stands out in its powerful simplicity. This plot corresponds precisely to the theatrical criteria of Kathakali, both in its length and in the number of characters involved. Scene 7. The Reconciliation of Lear and Cordelia. Premiered in 1989, Kathakali-King Lear, directed by Annette Leday and David McRuvie, was performed in prestigious venues throughout the world for over a decade. The last series of performances took place at the Globe Theatre in London from 6 to 17 July 1999. 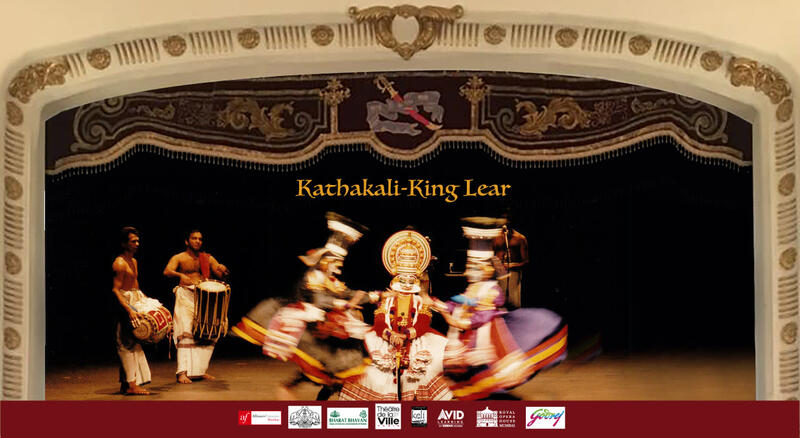 Since its creation, Kathakali-King Lear has become a reference in the field of intercultural performance. It was the object of enthusiasm and passionate polemics, as well as of numerous academic studies. (Diane Daugherty, “The Pendulum of Intercultural Performance: ‘Kathakali King Lear’ at Shakespeare’s Globe,” Asian Theatre Journal 22, no. 1 (April 1, 2005). Prof Phillip Zarilli, “For Whom Is the King a King? Issues of Intercultural Production, Perception, and Reception in a Kathakali King Lear” "The Critical Theory and Performance" of University of Michigan). Established in Mumbai since 1938, the Alliance Française de Bombay has evolved in sync with the geographical and cultural expansion of the city. It has opened, in the last few years no less than nine centres for its language courses in different locations of the ‘Maximum City’, catering more than 4000 students each year. Its head quarters have remained in south Mumbai, the historical and administrative heart of the city, but its classes have spread all over the city. Collaborating closely with the other prestigious cultural centers, the Alliance Française seeks to promote cultural exchanges between France and India, to initiate a dialogue of ideas and debates through contemporary creation that is accessible to all. Thanks to its diverse activities, the Alliance Française is the gateway to Europe and all French speaking countries and their cultures. The Alliance Française de Bombay is composed of a cultural department and an academic department. The Executive Director, Frédéric Simon, is in charge of the cultural events in addition to administrative responsibilities. He oversees the cultural programs, the organization of events as well as private partnerships. The Academic Director, Laurent Elisio Bordier, is in charge of the education department which organizes FFL (French as a Foreign Language) studies and program development for teachers, general public and private companies. It is also under his responsibility that all certified examinations are organized. Avid Learning, a public programming platform and cultural arm of the Essar Group, has conducted over 950 programs and connected with more than 100,000 individuals since its inception in 2009. Driven by the belief that Learning Never Stops, AVID’s multiple formats like Workshops, Panel Discussions, Gallery Walkthroughs, and Festival Platforms create a dynamic and interactive atmosphere that stimulates intellectual and creative growth across the fields of Culture & Heritage, Literature, Art and Innovation.